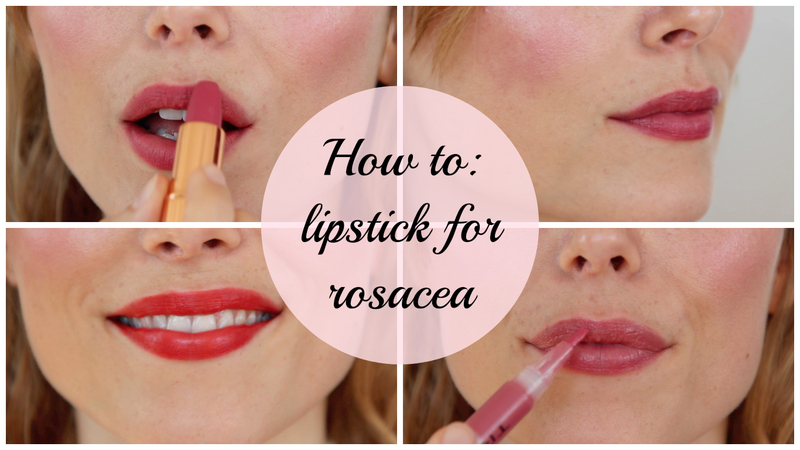 Rosacea is a common chronic inflammatory skin condition affecting the face primarily cheeks, nose, chin, central forehead and includes eye symptoms. It’s believed to be highly under-diagnosed, as mild to moderate cases can go on untreated without consulting a doctor. It’s characterized by redness, flushing, inflammatory papules and pustules, telangiectasia (dilated blood vessels) and phymatous changes (thickening of the nose). Read more about subtypes here. 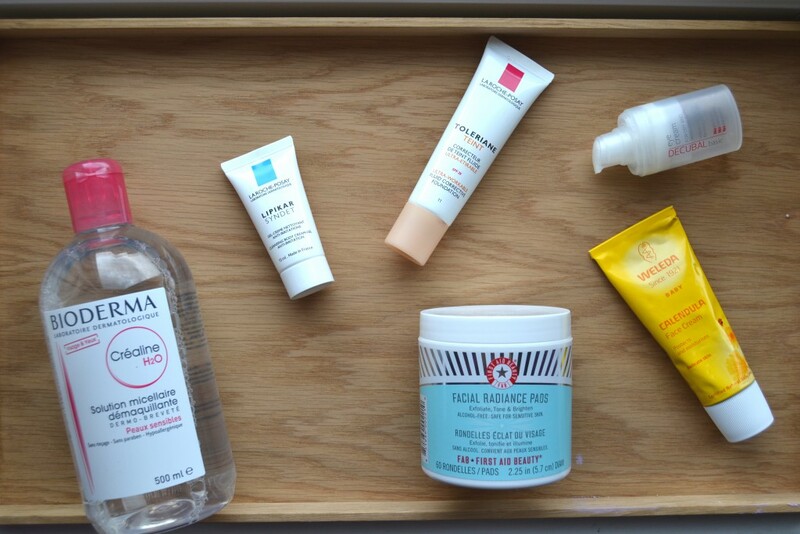 People with rosacea often have inherently compromised skin barrier with increased transepidermal water loss and decreased epidermal hydration leading to dryness and sensitive skin. 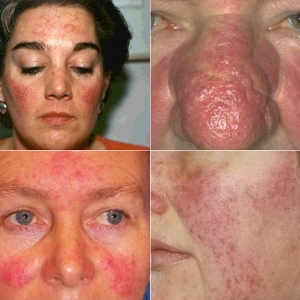 5.46% of adults are estimated to suffer from rosacea. Women & men are affected equally (contrary to previous knowledge). Typical onset age 30 to 65. Fair skinned people and familial disposition are more likely to get rosacea. 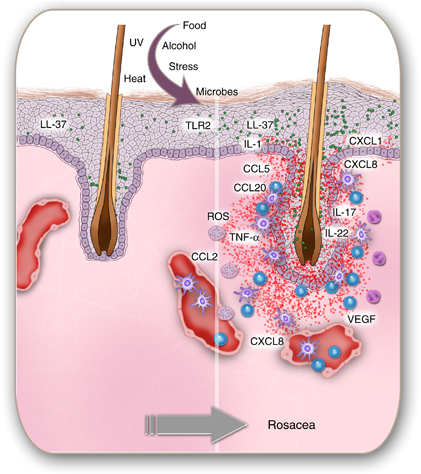 Microorganisms, like the skin mite Demodex folliculorum and staphylococcus epidermidis, may contribute to development of rosacea by stimulating the innate immune system driving the inflammatory response causing the papules and pustules. Neurogenic dysregulation of the vessels in the skin may contribute to rosacea symptoms such as flushing and burning. Genetic heredity also plays a role. Gallo RL, Granstein RD, Kang S et al. 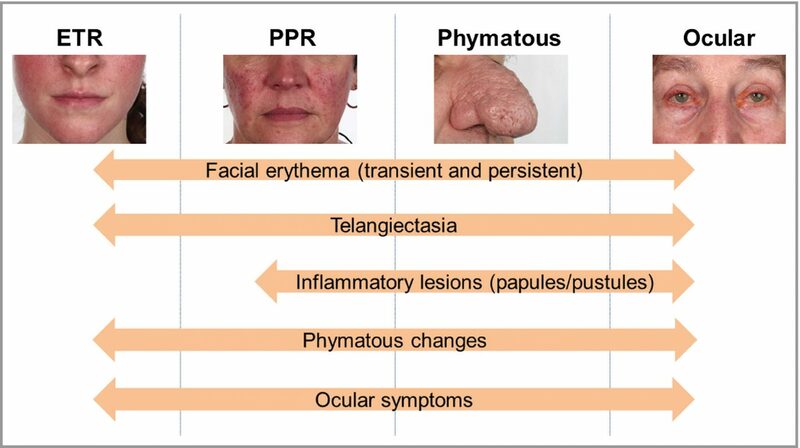 Standard classification and pathophysiology of rosacea: the 2017 update by the National Rosacea Society Expert Committee. J Am Acad Dermatol 2018; 78:148–55. The Beauty Blender – a savior for sensitive skin?